I just wanted to show you a quick picture of my wife leading her first song at International Baptist Church. I have to be honest when I say that I was as proud of my wife as I have ever been doing her choir leading thing. I know that to her technical ears, there could have been some improvement, but I was pumped. 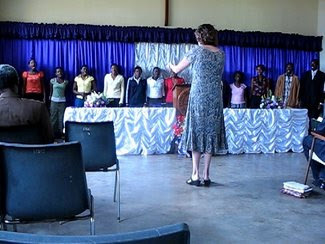 It was so cool to see her leading this Zambian choir of young people and I thought it sounded great. It is cool to look at the picture now and how I wish I could introduce you to these young people.